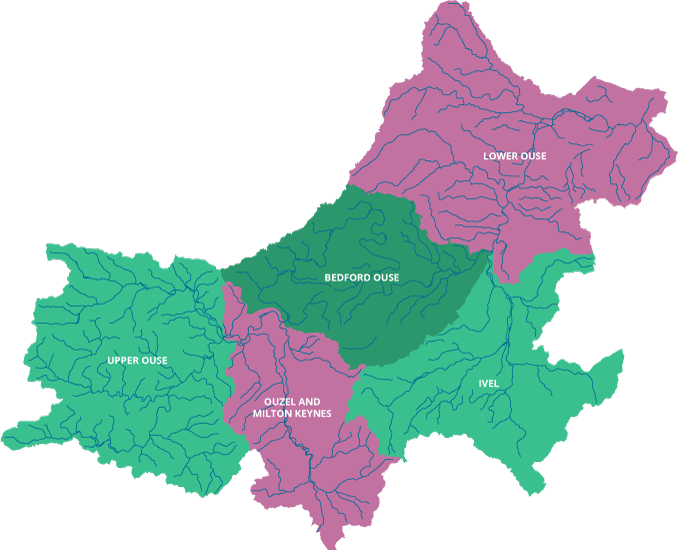 The Upper & Bedford Ouse catchment is one of 11 management catchments forming the Anglian River Basin District. The catchment covers an area from the headwaters of the River Great Ouse west of Buckingham and Brackley to east of Huntingdon and St Ives, where the river flows into the Old Bedford & Middle Level and Cam and Ely Ouse catchments – and on to The Wash. The River Great Ouse dominates the catchment, from its source near Brackley, flowing north east to Earith. Main tributaries include the Padbury and Clayden Brooks, rivers Tove, Ouzel, Flit, Ivel, Kym and the Alconbury Brook. The Grand Union Canal crosses through the catchment and is a key inland waterway link from London to the Midlands. Major urban areas are Brackley, Milton Keynes, Buckingham, Leighton Buzzard, Bedford, St Neots, Huntingdon, Hitchin, Letchworth and Baldock. Land is largely used for agriculture, but with extensive sand, gravel and clay deposits, the catchment is also important for quarrying. Redundant pits have been used for waste disposal or as lakes for water sports, fisheries and nature reserves. Our Catchment Plan is based on actions and aspirations within these operational catchments. Please click on an operational catchment for more information. Operational Catchments are further divided into waterbodies – discrete sections of rivers, lakes or groundwaters that have their own characteristics. In 2009, 25% of water bodies were classified at Good Ecological Status or Good Ecological Potential; and there were no bad water bodies. Interim results from 2013 indicate a slight increase in the number of Good Ecological Status (GES) or Good Ecological Potential (GEP). However, there are fewer Moderate waterbodies, with more Poor and 3 Bad waterbodies. pollution from rural areas – primarily from agriculture and rural land management. Further information on the Upper & Bedford Ouse catchment, including detailed information on the classification of water quality, reasons for failure to meet Good status and proposals for improving water quality, please see the Environment Agency Catchment Data Explorer.